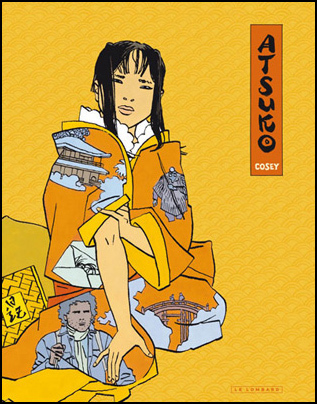 Cover of the special edition. After the experimentation with diary fragments in ‘ELLE’ (Jonathan 14), Cosey gives us a classic Jonathan album with ‘Atsuko’. The scenario consists of three threads: first, Jonathan travels after Atsuko, whom he met in Burma. Second, the thread of a theory of Atsuko’s aunt Hisa, about 8 hairs of Buddha on which the Burman temple of Shwe Dagon has been built. Third, the mysterious disappearance of this same aunt Hisa at the night before her marriage (she supposedly died two years later in an earthquake). I will not go into the story (read it yourself! ), but it is clear that the real mystery of the story is this aunt Hisa. On this page, I like to concentrate on three subjects: Jonathan as our Asian travel guide, a typical Cosey-esque element in the story and finally, the inspiration by Japanese woodcuts. For almost 40 years now, Jonathan is our travel guide to Asia. And I don’t mean the touristic highlight Asia, but he gives some insight in the ordinary, daily life in Asia. Which is not less interesting or exotic! In my pages on ‘The World of Cosey’, I have always loved to compare drawings from the albums with photographs I could find on the web. The ‘Intégrales’ have done this much better, of course, with the real thing. 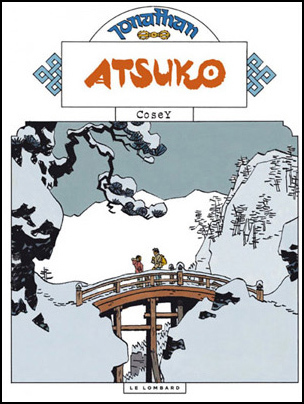 In the special edition of ‘Atsuko’ there is an introduction with sketches and photos that have helped Cosey create the background of his story. 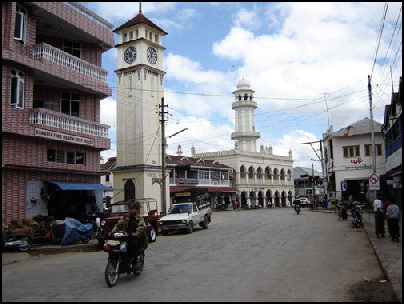 May Myo (Myanmar/Burma) is where the story starts. This picture above shows the street as on page 1 (I refer to the handwritten page numbers in the drawings – they are the same for both editions). The tower on the left is not in this drawing, but it is the famous ‘Big Ben’, whose bells are keeping Jonathan from sleep. Then Jonathan goes to Tokyo. He visits a comic store in the old quarter of Yanaka. 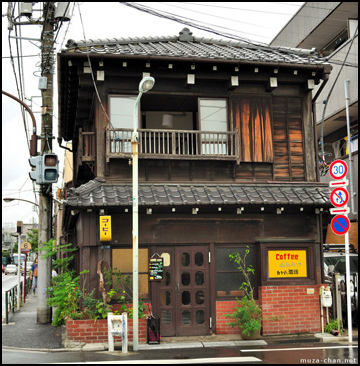 Yanaka is famous for its small wooden houses and its many temples. On the photos you see some traditional houses. Compare to the shop on page 12. 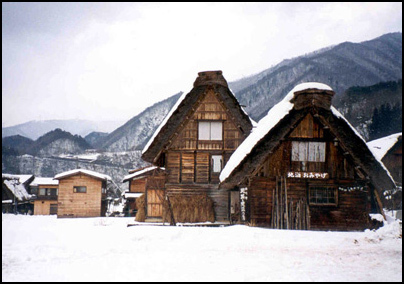 The main part of the story plays in Takayama and it surroundings. 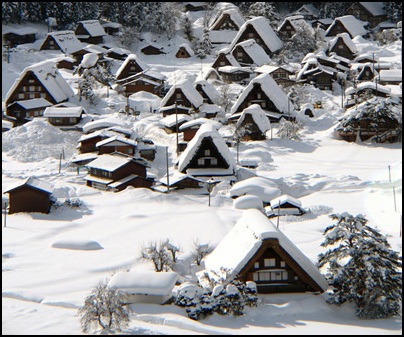 Takayama is a mountain village. This is a view of the village. The red bridge that is shown on page 15. The magic of Cosey at work: look at the concrete posts that Cosey manages to hide for us. A traditional Japanese ‘chalet’ around Takayama. Compare to page 43. One of the particular things about the Jonathan albums are the musical recommendations of Cosey. 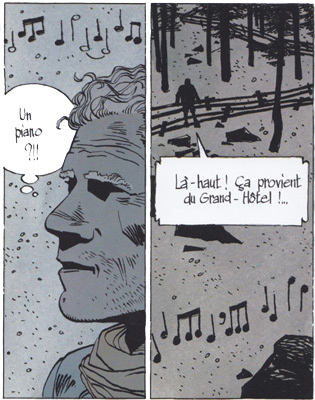 But in the stories themselves, music plays an important role, too. 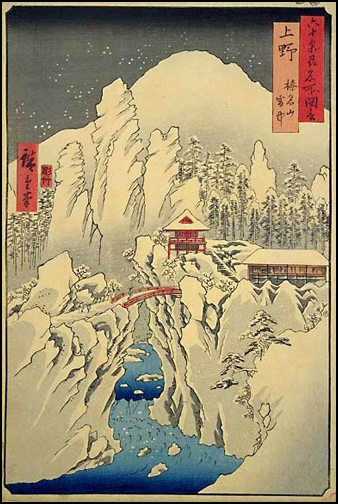 In this album, a song leads first Jonathan and later Atsuko through the Takayama mountains. See below a very similar scene from ‘À la recherche de Peter Pan’. And here is a picture from the second Jonathan album. Jonathan hears a songlike voice that finally guides him to the site of a priestess. Title of the album?… ‘Et la montagne chantera pour toi’. 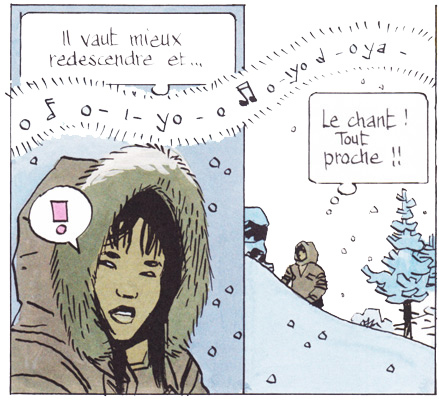 In more scenes from Cosey’s albums, music plays an important role (in ‘Le Bouddha d’Azur’, Porridge recognises Lhahl as a nocturnal spy when she sings ‘Love me do’). I just took these three striking similarities to show you we are talking about a classic Cosey album. In Cosey’s way of conceiving albums, the places, surrounding, environments of the story come first. He travels himself, and some time later (a few years sometimes), a certain sense of nostalgia sets in… giving him the stage for his stories. 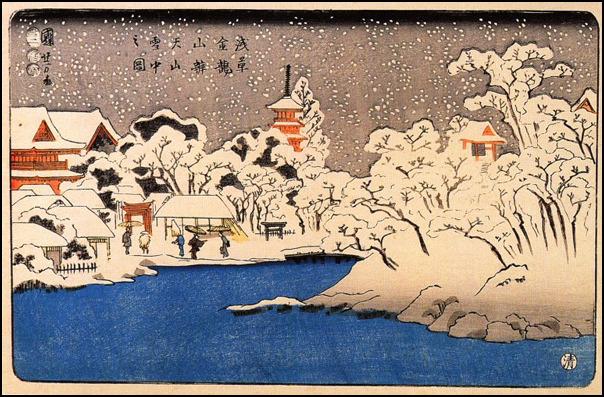 In this album, Japanese influence is very apparent, especially the inspiration by Japanese woodcuts. There are obvious similarities between comics and woodcuts: the black lines, the flat colours and the fact that they are both meant for reproduction (books or prints). So it is a logical source of inspiration. 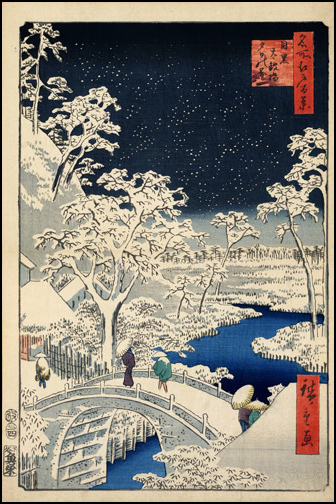 Let’s start with one of the most famous artists, Hiroshige. This is ‘Drum bridge at Meguro’ (~1857). 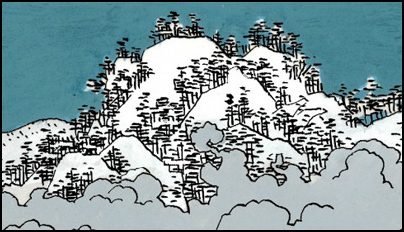 I took a detail from this woodcut of the trees in de background; compare it to Cosey’s trees (a detail from page 48). 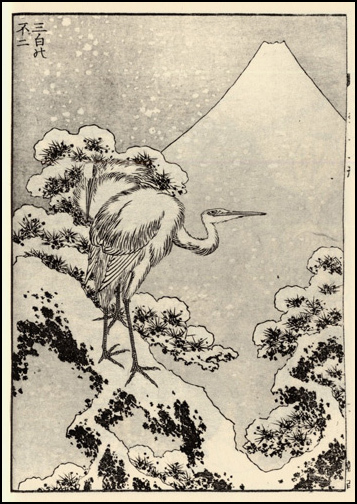 Below, a woodcut from another famous artist, Hokusai (probably best known for his ‘wave’). Special interest for comparison: the pine tree branches covered with snow. 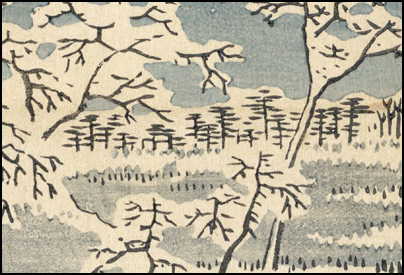 Compare this woodcut below (or ink drawing, I am not sure) by Morikuni with page 45, bottom left. 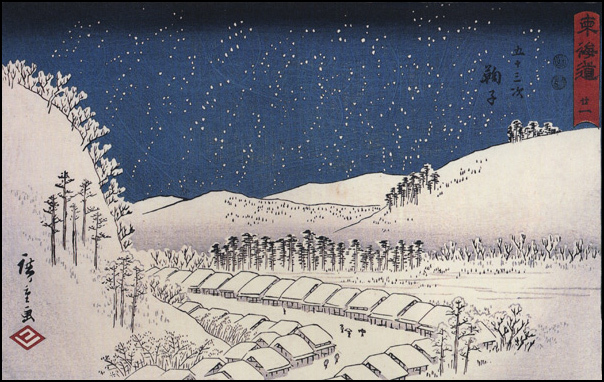 On page 20, Jonathan and Atsuko mention Hiroshige and Hokusai when they are standing in the snowcovered landscape around a replica temple – the house of Atsuko’s family. 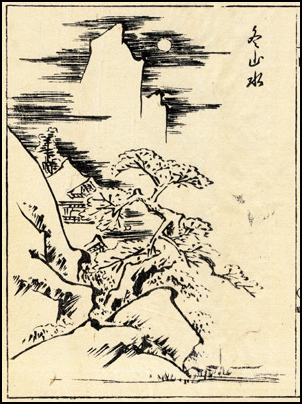 Of course, I have searched for a woodcut by one of them that would perfectly match Cosey’s drawing (and photographs of a small Kyoto temple). I could not find it, but I like to believe this is some kind of joke Cosey is playing on us… so help me find it! 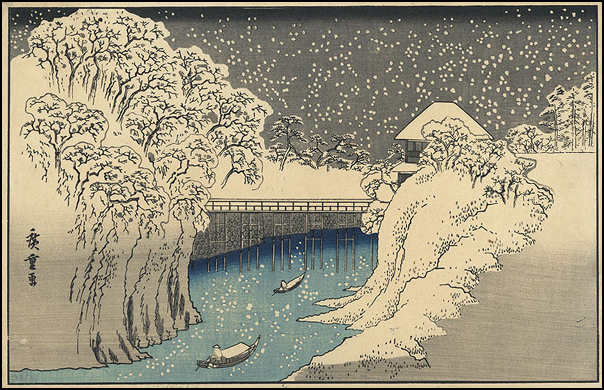 At least, I will show you some other woodcuts that are too beautiful to leave out. All of them could have been images in ‘Atsuko’.